a German computer chess aficionado, tester, as well as tournament organizer and journalist. He also wrote a DOS chess program in Basic, dubbed Capa . Thorsten cooperated with many chess programmers as tester and operator, most notably with Chris Whittington author of the mighty Chess System Tal, and occasionally with Ed Schröder, Christophe Théron, John Stanback, Martin Bryant, Ryan Benitez and probably others. Thorsten also hosts a HIARCS Fan Page . As teenager, Thorsten was already a computer chess enthusiast and collector of dedicated chess computers, playing private tournaments. He started to write articles for the German computer chess magazine Computerschach und Spiele (CSS), but soon had issues about evenhandedness with the responsible CSS editors Dieter Steinwender and Frederic Friedel, which results in cessation of the collaboration and disrespect, as still manifested in Thorsten's own online computer chess magazine Schachcomputerwelt . Thorsten was a critic of the close relations between CSS, CSS-Shop and ChessBase, as cause of possible conflict of interests related to independent journalism and test-reports of computer chess products . Thorsten Czub is active poster in Computer Chess Forums and was co-founder of the Computer Chess Club 1997  , after the unmoderated rgcc suffered from flaming by various posters. Along with his political principles, his courage, and his animosity against authorities, Thorsten was involved in heated and disputed discussions, and surely overacted sometimes. He served as moderator in CCC and also was subject of moderator actions  and receded twice as elected member of CCC moderator teams. 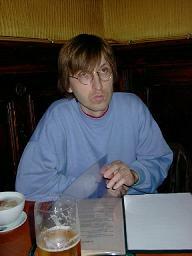 In 2001, while living in Berlin, Thorsten was primary organizer of the First Berliner Emanuel-Lasker Computerchess-Tournament 2001.